Mushrooms and onions are commonly considered a garnish, but they count toward your daily vegetable requirement. Adults should eat at least 2 1/2 cups of vegetables every day, according to the 2010 Dietary Guidelines for Americans. Whether they are piled on top of a streak or tossed into a stir-fry, each ½ cup of mushrooms and onions represents one-fifth of your daily vegetables. 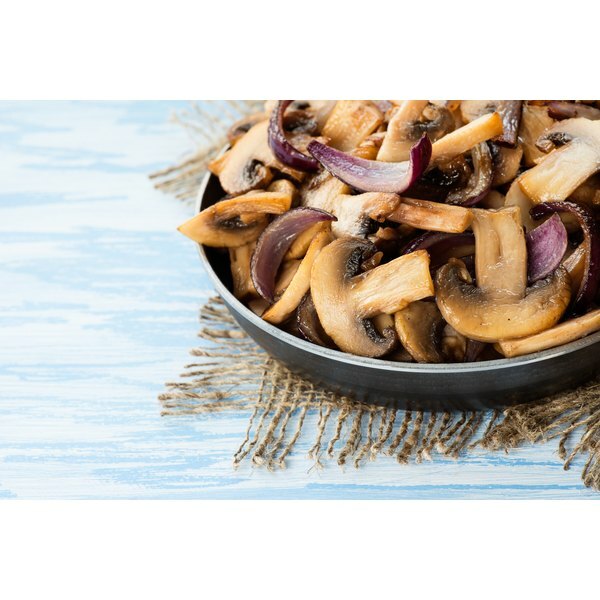 Sauteed Mushrooms & Onions has 297 Calories and 14.84 g of Protein per 100 gram serving according to the nutrition facts provided by the USDA Food Composition Database. Each 1/4 cup of sauteed onions has 29 calories, 1.71 g of carbohydrate, 0.21 g of protein, 2.35 g of total fat, 0.321 g of saturated fat and 0.4 g of fiber. Each 1/4 cup of sauteed mushrooms has only 7 calories, 1.09 g of carbohydrate, 0.97 g of protein, 0.09 g of total fat, 0.011 g of saturated fat and 0.5 g of fiber. An evenly mixed 1/2-cup serving of sauteed mushrooms and onions has 36 calories, 2.8 g of carbohydrate, 1.18 g of protein, 2.46 g of total fat, 0.332 g of saturated fat and 0.9 g of fiber. The amount of fat present is only what remains in the mushrooms and onions after sauteing. The more oil or butter you use, the more fat and calories the mushrooms and onions will contain. To keep the calorie count low, drain off any excess liquid before serving. The mineral content of 1/2 cup of sauteed mushrooms and onions includes 5 mg of calcium, 0.13 mg of iron, 5 mg of magnesium, 35 mg of phosphorus, 126 mg of potassium, 6 mg of sodium, 0.2 mg of zinc, 0.083 mg of copper, 0.035 mg of manganese and 3.8 mcg of selenium. The vitamin content of 1/2 cup of sauteed mushrooms and onions includes 0.4 mg of vitamin C, 0.037 mg of thiamine, 0.134 mg of riboflavin, 1.084 mg of niacin, 0.428 mg of pantothenic acid, 0.056 mg of vitamin B-6, 4.7 mcg of vitamin K and 1.23 mg of gamma-tocopherol.